The Tataviam Indians, a Shoshone-speaking people, arrived in the Upper Santa Clara River Valley (Santa Clarita Valley) about AD 450. They occupied an area bounded by Piru to the west, Newhall to the south, the Liebre Mountains to the north, and Soledad Pass to the east. The word tataviam roughly translates into "People of the Sunny Slopes." Their Chumash neighbors on the coast called them "Aliklik," believed to be a derogatory term mimicking the clicking sound of their language. While it is not known exactly who preceded the Tataviam, the same area was occupied by a people, probably of Chumash origin, who arrived somewhere between 4,000 and 10,000 years ago. 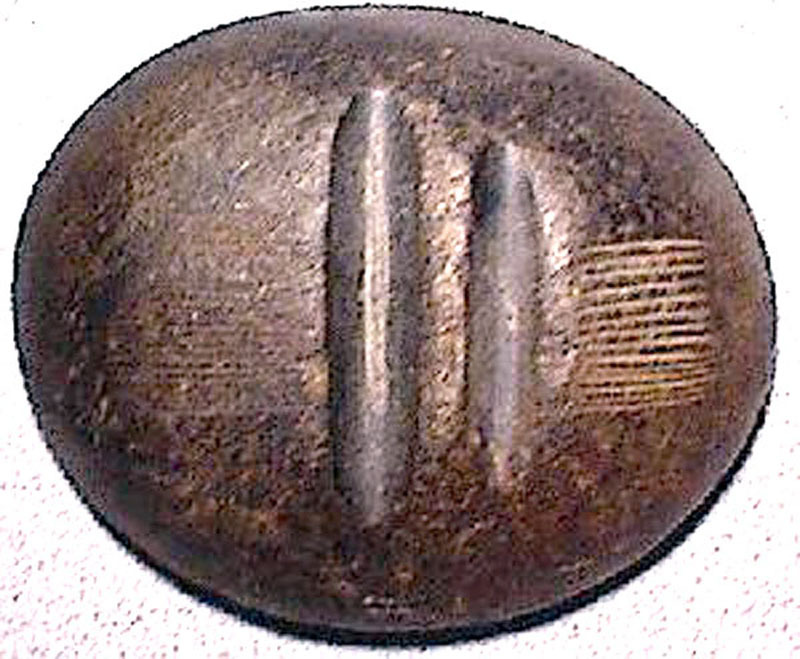 The Tataviam were hunter-gatherers who organized into a series of autonomous tribelets throughout the region. They ate acorns, yucca, juniper berries, sage seeds and islay, and they hunted small game. They likely practiced a shamanist religion that put them in touch with the supernatural world through trances and hallucinations brought on by the ingestion of jimsonweed, native tobacco and other psychoto-mimetic plants found along the local rivers and streams. Such habitats also provided raw materials for baskets, cordage and netting. The Tataviam left behind a vast treasure of rock art at Vasquez Rocks, which is thought to have been a major trading crossroads. 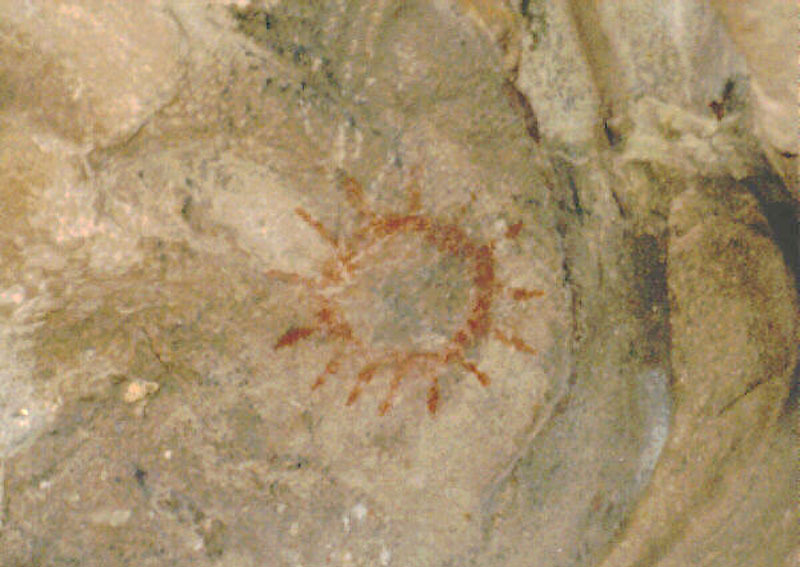 The Indians used berries, charcoal and other indigenous materials to emblazon a variety of images inside caves and onto the rock surfaces. Most images had religious meanings, and while they suffered both natural degredation and vandalism during the 20th Century, steps have been taken to preserve them. The most significant 40-acre region was closed to the public in 1996. * NOTE: While Fustero liked to bill himself as the "Last of the Piru Indians," an article in the Los Angeles Herald Examiner in 1965 says that Fustero may actually been married to a full-blooded Tataviam woman, and that they had children. According to the tribes that represent local Native American families, as of 1997 there were approximately 600 persons of Tataviam descent living in Los Angeles County. Update: The pictographs have been off-limits to the public since 1996. Photograph by Leon Worden in 1995. Further reading: The Tataviam: Early Newhall Residents by Paul Higgins.